The EIT Says They’re Totally Fine With Immigration Reform Bill Dying In The House: So Why Did They Support It In The First Place? Napp Nazworth, over at the Christian Post, ran an article on Wednesday entitled, “House Not Voting on Senate Immigration Bill Is OK, Evangelical Immigration Table Says”. As long as progress is made toward reforming the United States’ immigration system, members of the Evangelical Immigration Table are not disturbed at Speaker of the House John Boehner’s announcement that the House would not take up the Senate bill, they said Tuesday on a press call. David Cooper, president of Front Range Christian School in Littleton, Colo., responded that he would “echo” Staver’s remarks. “I think that speaks for most of the organizations that are part of the Evangelical Immigration Table,” he added. The article quotes three members of the EIT: Mat Staver, David Cooper, and Noel Castellanos. Staver and Castellanos are two of the “heads” of the EIT, as listed on their website. Noel Castellanos, CEO of the Christian Community Development Association, added that the EIT would work to build bipartisan support in the House for immigration reform legislation based upon the principles outlined by the EIT, just as they did in the Senate. The EIT placed a full page ad Tuesday in Politico thanking the Senate for passing immigration reform. Plus, the organization will hold another rally in Washington, D.C., on July 24 to build support in the House for a reform bill. I’m sure the less ideological signatories of the EIT will be somewhat relieved if this extreme bill does not pass. This headline is misleading, suggesting that these signers speak for the whole. The three men who have led the media campaign for the Table so far are Richard Land, Jim Wallis, and Sammy Rodriguez; I’d like to know what they think about the Gang of Eight Bill not passing the House. This article seems to imply that the EIT never really cared about legislation, that it’s all about the principle of the thing. The EIT ought to pick a side: do they support this legislation, as their ad campaign suggests, or are they just trying to make a statement? If it’s the latter, then to what end do they exist? One Response to The EIT Says They’re Totally Fine With Immigration Reform Bill Dying In The House: So Why Did They Support It In The First Place? 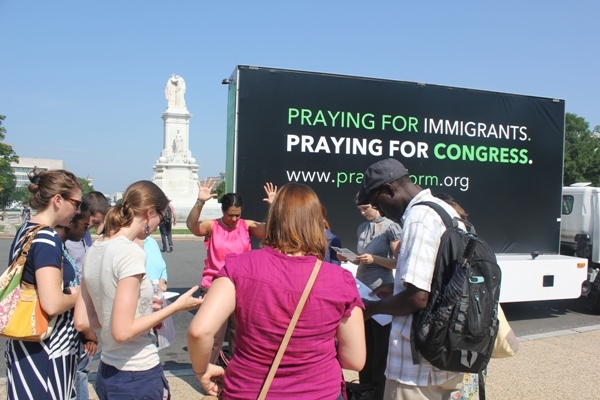 EIT exists to promote dialogue that results in immigration reform that reflect Biblical principals. It is really very simple.